Langerhans's cell histiocytosis (LCH) is a proliferative disorder of Langerhans' cells, but its nature whether reactive, benign, or malignant is still controversial. Historically, the nomenclature regarding LCH has been confusing because the disease had been subcategorized simply based upon different clinical manifestations  . As histiocytosis X, eosinophilic granuloma if solitary lesion, Hand-Schuller Christian disease if multiple lesion, Letterer-Siwe disease if disseminated or visceral involvement  . Ordinarily, patients with solitary disease have localized pain. Patients with disseminated disease may have lymphadenopathy, skin lesions, or diabetes insipidus  . 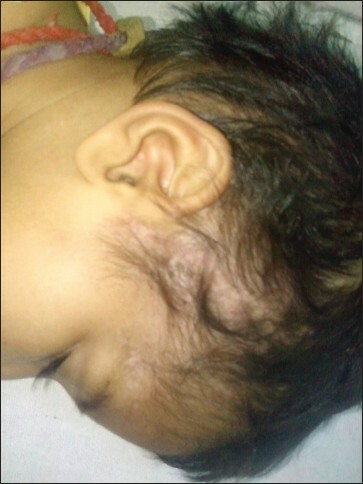 A 2-year-old girl reported to the outpatient department of tertiary care hospital with swelling in front and behind right ear of 3-month duration [Figure 1]. She gave a history of right ear discharge 2 months back. Examination revealed diff use and soft swelling. No punctum was noticed. The swelling was nontender. The overlying skin was normal. Systemic examination revealed no abnormality. A laboratory finding suggests anaemia with normal liver and renal function test. High-resolution computed tomography findings were suggestive of centrally necrotic malignant lesion in right mastoid temporal and orbital regions showing frank bony destruction and extension with right middle cranial fossa, temporal bone and right orbit did not show any lesion elsewhere in the body. 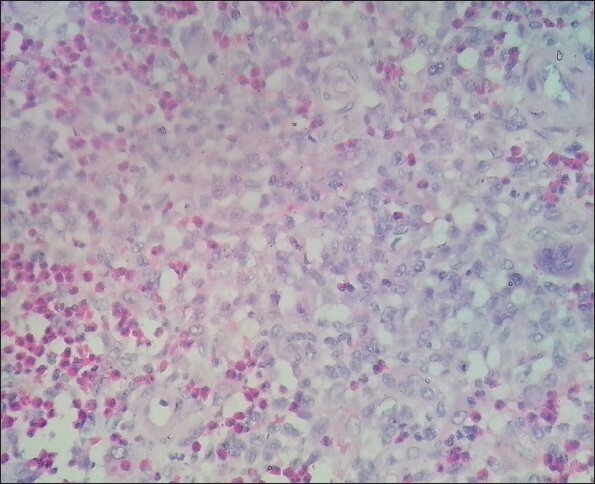 On microscopy examination [Figure 2], the section from biopsy right temporal region shows histiocyte like cells in sheets along with intermixed eosinophils and few lymphocytes. Cells are round having indented, lobated, vesicular nuclei along with moderate to abundant delicate pale cytoplasm. Few cells show nuclear folding (grooving). Few foamy cells and multinucleated giant cells were also seen. Areas of necrosis haemorrhage along with bits of bony tissue noted. On Immunohistochemistry, histiocytic-like cells were reactive for S-100 [Figure 3] and CD 1a. and were immunonegative for CD-68 and CD-30, whereas multinucleated giant cell express CD-68. Final diagnosis was given LCH. LCH is a disease of unknown cause and diverse manifestations. In 1953, Lichtenstein proposed that the disease entities known as eosinophilic granuloma, Hand-Schuller-Christian disease and Letterer-Siwe disease all share a common pathologic appearance. This view was challenged by Lieberman et al. , . They suggested that Letterer-Siwe disease is not a specific entity but may involve several pathologic processes. Evidence, however, suggests that at least some examples of disseminated disease with features of Letterer-Siwe syndrome are examples of LCH  . It was once thought that LCH most likely represented a reactive disorder rather than a neoplastic process. More recent studies, however, have demonstrated clonality in LCH, supporting a neoplastic origin  . The differential diagnosis includes osteomyelitis on one hand and malignant lymphoma on the other. Rarely special stains may help in separating an unusual form of osteomyelitis from LCH. LCH cells are usually positive for S-100 protein. However, the most specific marker of LCH is CD1a and langerin. CD1a expression can be detected in frozen or in paraffin embedded tissue by use of the monoclonal antibody O10  .In malignant lymphoma, the characteristic nuclear features of LCH are absent. LCH represents a disease with a diverse spectrum of clinical manifestations. Herein through this case, we summarize the current recommendations for diagnosis LCH. A definitive diagnosis of LCH can be made by obtaining a biopsy that yields cells that are morphologically and immunohistochemically compatible with Langerhans' cells. The prognosis depends chiefly upon the involvement of multiple organ systems, organ dysfunction, and the patient's response to chemotherapy during the initial 6 weeks of treatment. 1. Satter EK, High WA. Langerhans cell histiocytosis: A case report and summary of the current recommendations of the Histiocyte Society. Dermatol Online J 2008;14:3. 2. Jaffe R, Weiss LM, Facchetti F. WHO classification of haematopoietic and lymphoid tissue. Lyon: IARC; 2008. p. 358-60. 3. Chatterjee T, Naithani R, Agrawal N, Bhattacharya J, Bhattacharya M, Dutta P, et al. Disseminated Langerhans cell histiocytosis-an interesting case report with concise review of literature. Indian J Pathol Microbiol 2006;49:248-50. 4. Lichtenstein L. Histiocytosis X: Integration of eosinophilic granulomas of bone, "Letterer-Siwe disease," and "Schuller-Christian disease" as related manifestations of single nosologicentity. AMA Arch Pathol 1953;56:84-102. 5. Liberman PH, Jones CR, Dargeon HW, Begg CF. A reappraisal of eosinophilic granulomas of bone, Hand Schuller Christian syndrome and Letter Siwe syndrome. Medicine (Baltimore) 1969;48:375-400. 6. Novice FM, Collision DW, Kleinsmith DM, Osband ME, Burdakin JH, Coskey RJ. Letterer-Siwe disease in adults. Cancer 1989;63:166-74. 7. William CL, Busque L, Griffi th BB, Favara BE, McClain KL, Duncan MH, et al. Langerhans′ cell histiocytosis-a clonal proliferative disease. N Engl J Med 1994;331:154-60. 8. Emile JF, Wechsler J, Brousse N, Boulland ML, Cologon R, Fraitag S, et al. 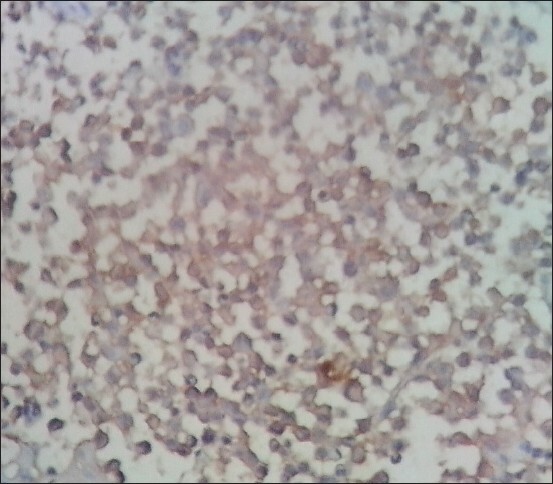 Langerhans′ cell histiocytosis. Definitive diagnosis with use of monoclonal antibody O10 on routine paraffin embedded samples. Am J Surg Pathol 1995;19:636-41.